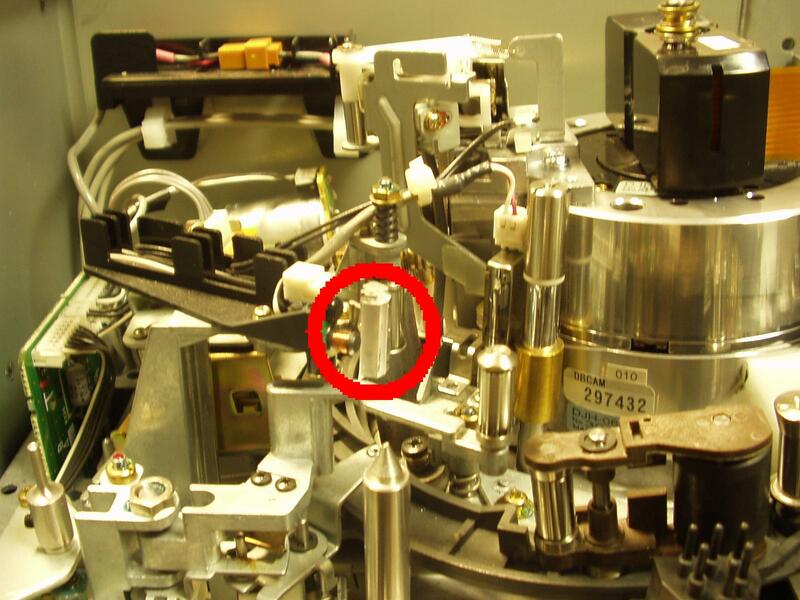 Check that the machine is not in use, and that you’re working on the correct machine. 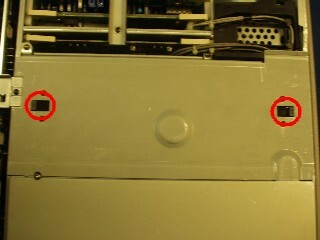 Switch off the machine, (figure 3) and pull it out of its bay. 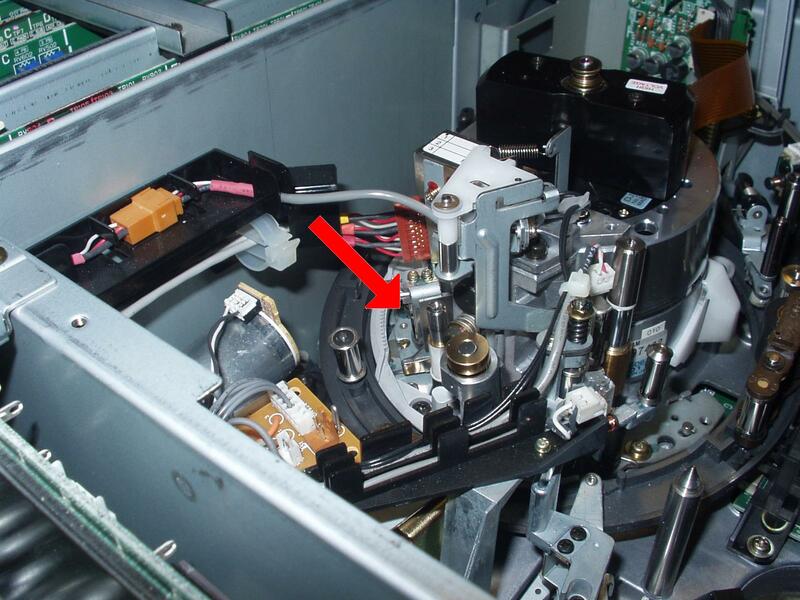 The next plate towards the front of the machine is secured by two Phillips head screws (marked in figure 6.) 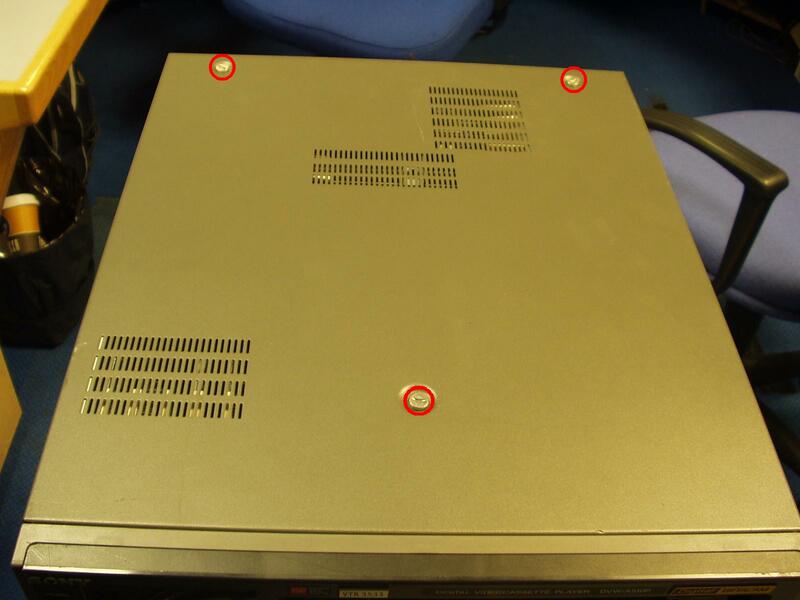 Remove these, and lift off the plate. 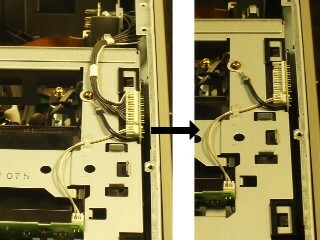 Figure 7 - edge connecter! 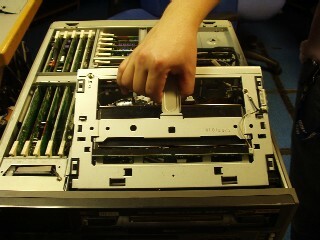 The cassette transport should now lift out. 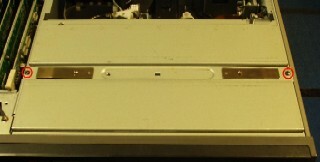 Gripping the central strut, lift the far side first, to free the part near the front of the machine (see figure 8.) 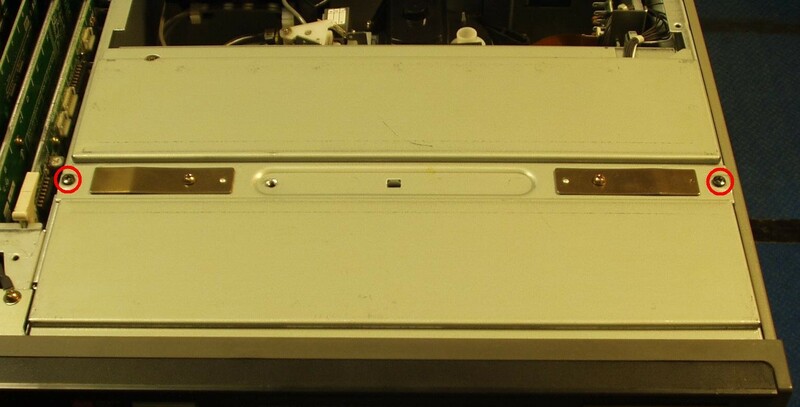 Again, this shouldn’t require any force. 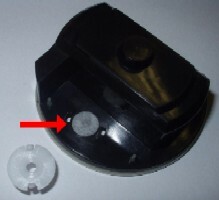 There is a black plastic cover on top of the drum, secured by two Phillips screws on its left side (marked on figure 9.) Remove these two screws (using the No. 1 phillips driver,) and lift off the cover. 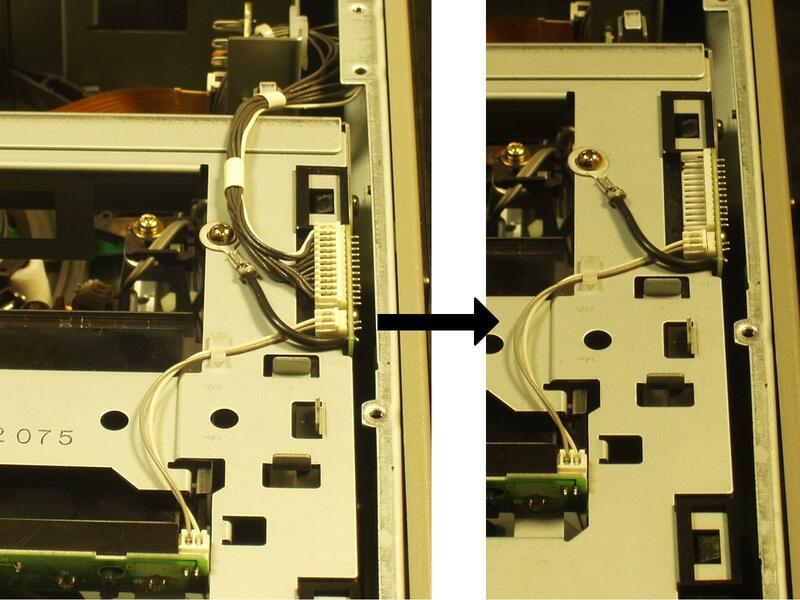 Take care not to damage the ribbon cable slotted into the lower right of the cover. 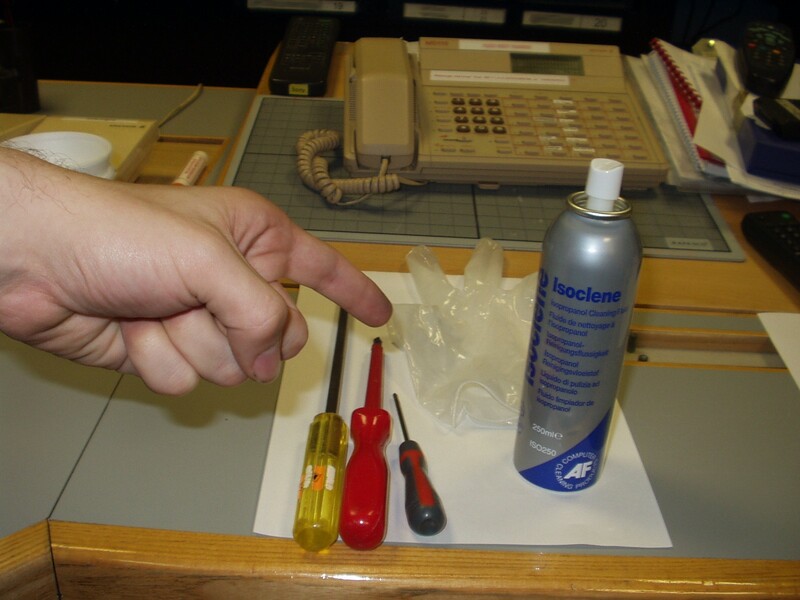 Put some alcohol on a cleaning cloth, wearing a glove on the hand that is holding the cloth. 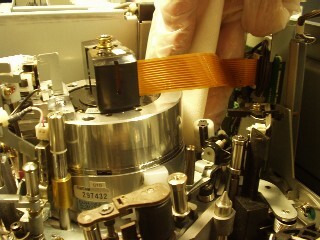 Holding the cloth still against the groove on the side of the drum, and spin the drum anticlockwise using the exposed part on top. (See figure 10.) Never move the cloth vertically while doing this. Check the cloth. 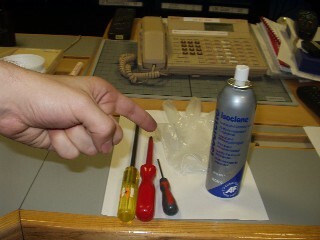 Repeat the action, using a clean part of the cloth, until no more dirt is removed. Clean the clear plastic scraper. This is mounted away from the drum, at about the 7 o’clock position an inch or so from the drum (Figure 11.) Slide a piece of paper down the central gap to clean out any stuck bits of oxide. Slide the VTR back into its bay. 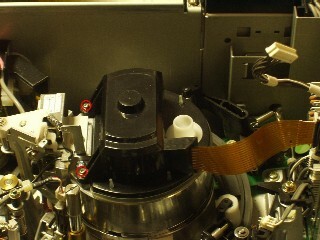 Power the VTR on (figure 3,) and check its output using a test tape. 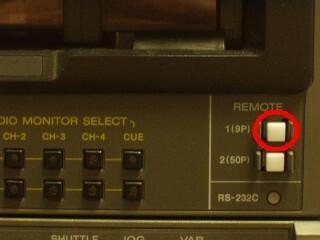 If the VTR doesn't respond to commands, you might have to put it into local mode, by pressing the button shown in Figure 14 so that it isn't illuminated. 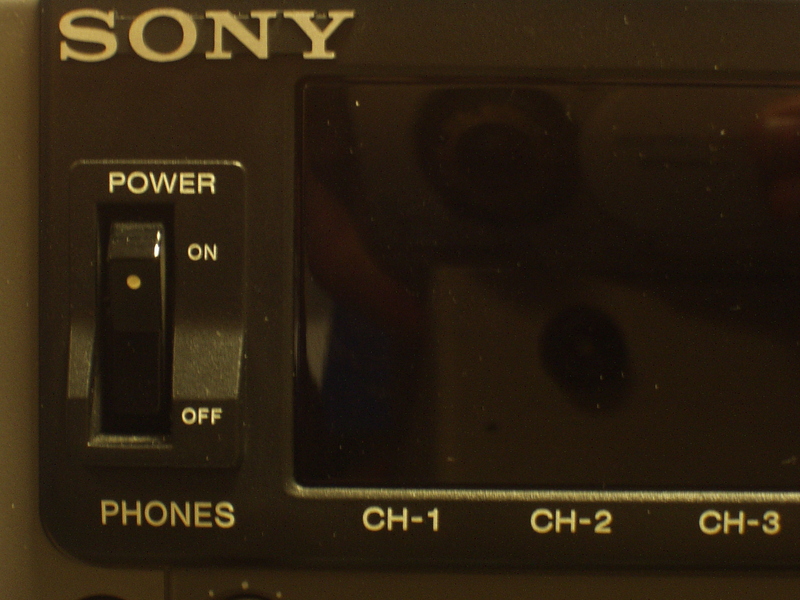 Switch the VTR back into remote control by pressing the button in figure 14 so that it's illuminated. Tell the user that the VTR is ready for use.